When coming to Portugal you simply have to visit Sintra. The town, castles and gardens are beautiful and definitely not to be missed. In 1995 the entire area has been added to the UNESCO World Heritage list. But the town of Sintra is pretty small, the streets are even smaller and with the many tourists visiting it can feel a bit overwhelming trying to get to where you want to be. And where is that? There are many different castles and gardens, how do you know which one to visit? 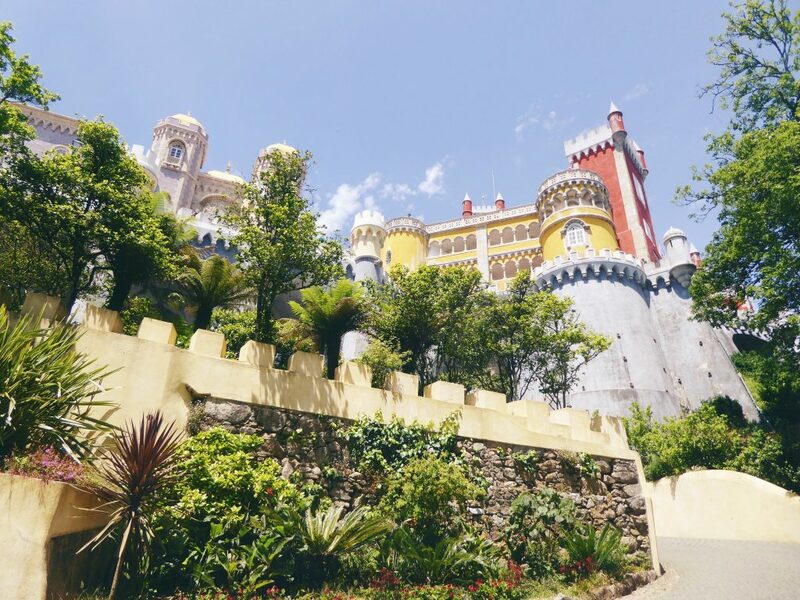 In this Ultimate Guide to Sintra’s Castles and Gardens we will tell you everything about different points of interest in Sintra. We even give the best insider tips we’ve gathered over the years, so you can make an informed decision on where to go and experience Sintra at it’s best. The most famous castle of Sintra is without a doubt Palácio da Pena. This colorful Disney-like castle sits on a hill 450 meters above the city of Sintra. So you can imagine views are amazing. 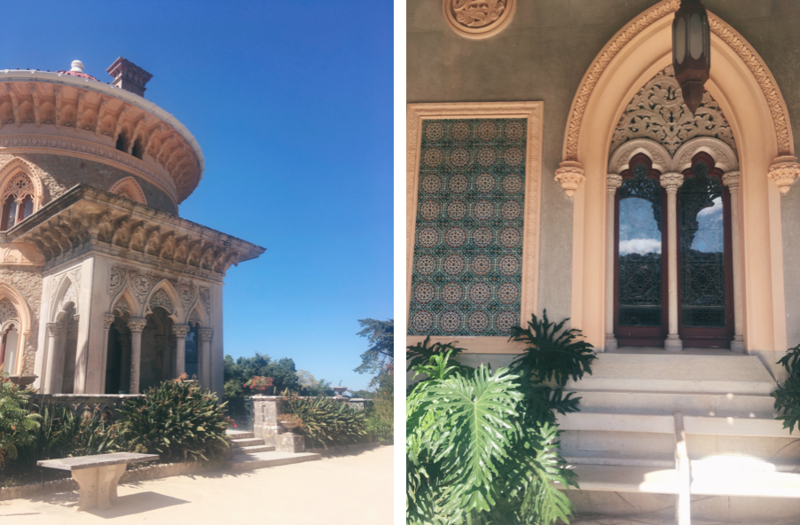 It was built between 1842 and 1854 after King Ferdinand II decided this should be the place for a summer residence for the Portuguese royal family. And it sure does look like a nice location for a holiday. The best time to visit Palácio da Pena would be on a clear day, so you can experience the great views from this mountaintop. Being the most popular castle of Sintra, it can be very busy here. Come early or visit between November and March. Visiting during winter is the best time to avoid the main tourist crowds. If you are not interested in the inside of the castle, you can also just buy a ticket for the outside and save almost 50% on your ticket price. In stead of going to the main entrance of the palace, go to the botanical garden a bit down the hill and walk up through the garden. 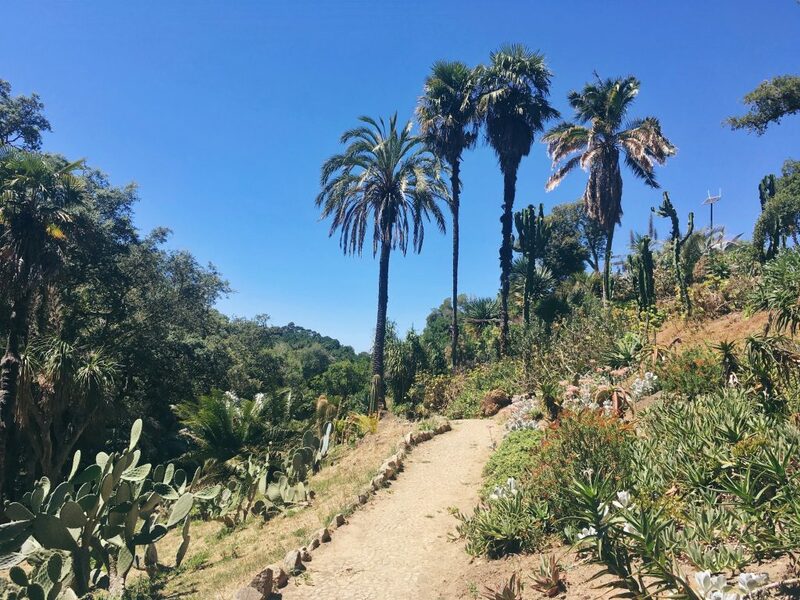 This way you can peacefully walk up the hill while enjoying the beautiful garden with a hidden greenhouse and little creeks, while avoiding the main tourist crowds. Park your car somewhere outside of Sintra and take a tuk tuk to the entrance of the botanical garden. Walk up from there. If you are feeling sportive, you can also rent a mountainbike and bike up the hill. Or, if you’re in for a climb, or you can walk up there from Sintra town. From Palácio da Pena you can already see this medieval castle on the hill next to you. Castelo dos Mouros, Castle of the Moors, dates back to the 10th century. This means that the castle is more than a thousand years old! It was built by the Moors and the wall is over 450 meters long. On a clear day the view is breathtaking. Same as for Palácio da Pena, the best time to visit Castelo dos Mouros would be on a clear day. Early in the morning or outside of the high season you will encounter less tourists. Because it’s very close to Palácio da Pena you can combine the two castles easily for a day trip. They are very different from each other. 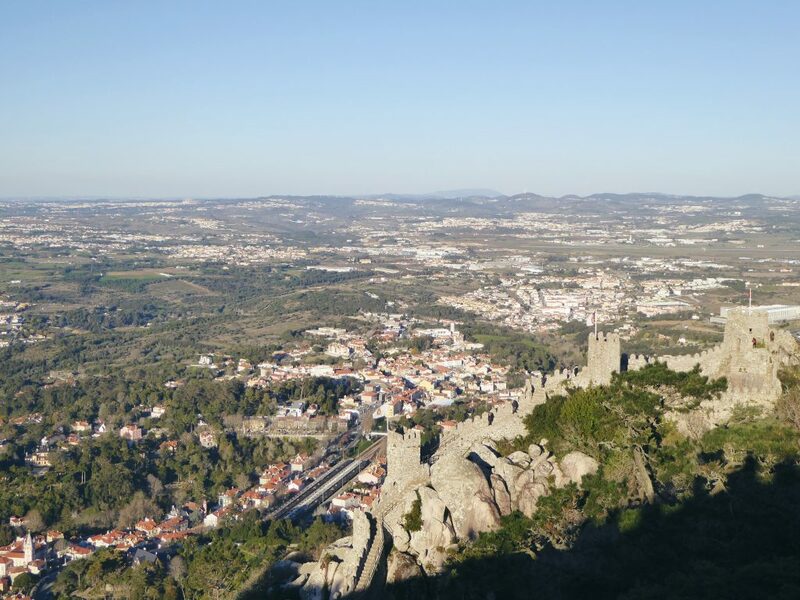 After visiting the castles you can walk up to Cruz Alta, the High Cross, and get an amazing view of the entire area, including both Palácio da Pena and Castelo dos Mouros. You can take a tuk tuk from town, but it’s more fun to walk the ‘caminho do Castelo dos Mouros’. This is a steep but quiet pathway of about 2km, starting in the center of Sintra and leading up to the castle. 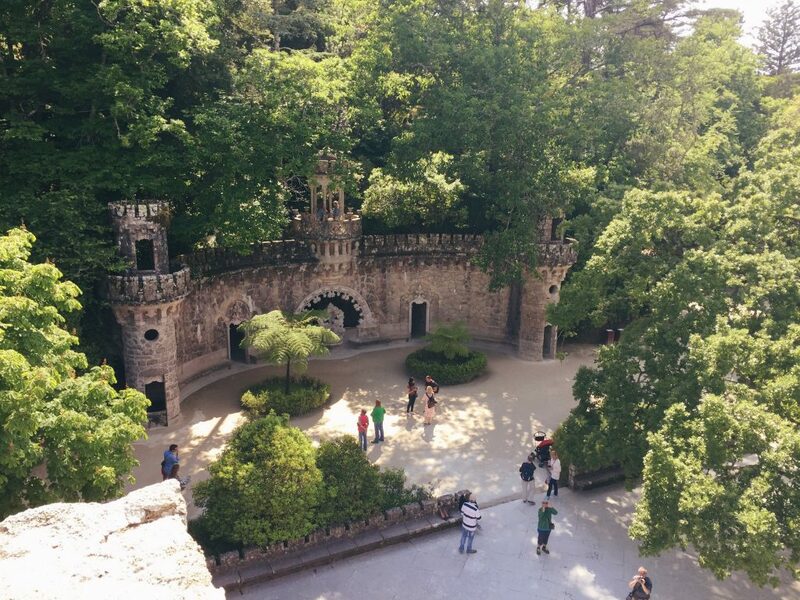 It is almost like Quinta da Regaleira was designed by a kid with a lot of fantasy. It’s really fun to walk around this park, with it’s little secret paths that lead you through tiny stairs, a pond with stepping stones and several caves and wells. The park was built between 1904 and 1910, in the last days of the Portuguese monarchy. The romantic property belonged to the Viscondessa da Regaleira, and was later enlarged by millionaire Monteiro. His vast fortune earned him the nickname of Monteiro dos Milhões, (Moneybags Monteiro). The park can get crowded in the high season, so if you want to see the park with not too many other people, we advise to visit it between November and March. In spring time the park is at it’s greenest and the flowers are in bloom. 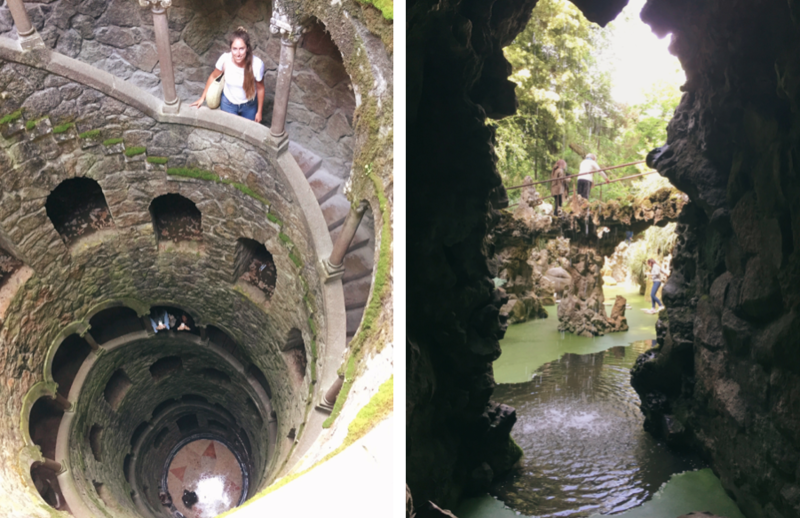 For a rainy or misty day a visit to Quinta da Regaleira is probably one of the nicest things to do. Because even when it’s raining, this complex of little paths and caves is wonderful to explore. Gloomy weather can add mystery and charm to this place. And inside the caves and under the big trees, you will at least be dry. Off all the castles and gardens mentioned in this blog, this is definitely the easiest to get to from Sintra town. You can also walk here in 35 minutes from the bus station Portela just outside of Sintra, or get a tuk tuk. Our personal favorite is the park and palace of Monserrate. Because this palace is just outside of Sintra, the main tourist crowds never go here. It is like the hidden gem of Sintra and truly worth visiting. 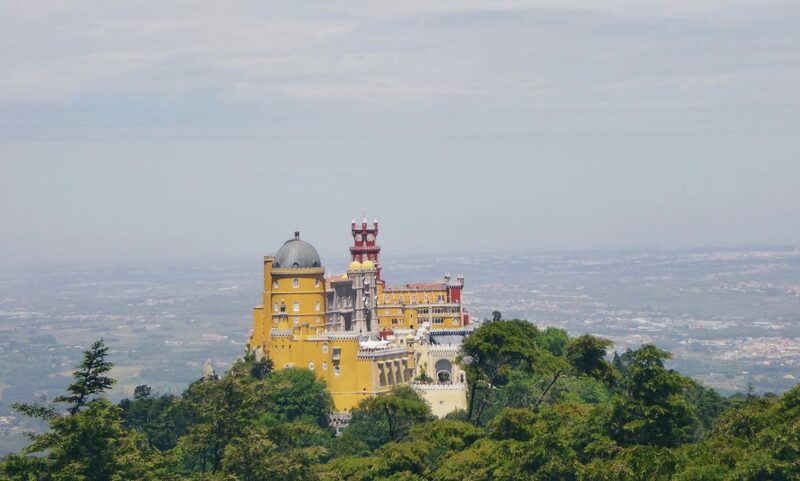 There is not a bad time to visit Monserrate, mainly because it is one of the least touristic places in Sintra. So you can just go any time and enjoy it with not too many other people. However, the park, and especially the rose garden, is at it’s best in spring. They do maintain the park really well, so all plants looks very healthy year round. Really take your time to walk around the garden. If you are into succulents and cacti, don’t miss the Mexican garden. The inside of the palace is also definitely worth a visit. You can walk around every room and gawk at the eye for detail that was used in decorating the walls and ceilings. Enjoy the tranquil terrace with view from the frontside of the palace. You can only get here by car, so make sure you rent one. There is a free parking area. When coming from Olá Onda in Ericeira, the route to Monserrate is already an attraction by itself. Tiny streets will lead you along the north side of Sintra, which offers a great view to the town and it’s castles in the hills. Rent a car and drive to Sintra. During the high season you do not want to drive into the center of town because it gets extremely busy. Make sure to check where to park outside of the center beforehand. Options are at the Portela busstation or the neighbouring town São Pedro de Penaferrim. Ask us for tips if you’re staying at Olá Onda. During the low season you can find enough parking space around the center of town and walk to wherever you want to go. From Ericeira it is a 40 minute drive. From Ericeira you can take the bus to Sintra. The bus station in Ericeira is a 10 minute walk from Olá Onda. The bus will take you in 50 minutes to Portela Station, just outside of Sintra. Find the timetable here.